The Walking Dead‘s seventh season has been a rollercoaster so far, with Negan going on a killing spree, Rick losing and rediscovering his mojo and our many adventures outside of Alexandria. We sat down with series stars Ross Marquand, Seth Gilliam and Alanna Masterson to chat how they’ve found the new season, the criticism surrounding the first half of the season and exactly how amazing the s7 finale is going to be. Season seven has been a rollercoaster. What has this season been like for you guys filming? Ross: I think the emotional severity of this season, for the first half, is what set it apart from other seasons. We’re just seeing this group beaten down over and over again by Negan and the Saviours and I think what we’re going to find in 7B is the straw that broke the camel’s back for most people has occurred. People are finally realising you can’t appease these men anymore. The only thing to do now is fight back. It’s just a matter of deciding what’s the best way to do that. Seth: I personally was very excited by it. I liked the idea of the heroes being beaten down to the point of nonexistence and trying to rediscover their inner fire. I think this season has been great for that. Strangely enough, the Saviours may have been one of the better thing’s that’s happened for [Father Gabriel]. It’s given him the opportunity to prove that he has some kind of worth to this group, that he can act quickly on his feet, that he can be a steadfast in his convictions and that he can be of service. To me, it’s been really exciting. We don’t get to see the episodes before they air so we’re watching them at the same time everybody else is, so I’m really looking forward to seeing what else is coming. We know what we put in the can, but we have no idea what it looks like. Alanna: On this show we get fans saying ‘THIS IS SO STUPID, YOU COULD HAVE KILLED NEGAN RIGHT THERE IN ALEXANDRIA’ and you’re like ‘cool, what would the show be…?’. It would be the most anticlimactic show in the world. I think it’s actually really great. We’re trying to figure out how we’re going to handle this dude and these people and I think it’s good to give a real motivation and get everyone together on the same page to really see that. Even you take out Negan, there’s outpost after outpost after outpost, what we think could be thousands and thousands of people – we have no idea. We thought we took out all of them in season six. We just don’t know the scope of it. Now we need an army. That’s what we’re looking for. Seth: What’s interesting is that we can feel that we’re the good guys, because obviously we’re the characters that people have been following. But when you look at it, we really did just burst into the outpost and kill a bunch of sleeping people and take their stuff. Alanna: That’s how you do it! You don’t face them while they’re alive! That’s just suicide. That’s an interesting point. We follow these guys and we see them as the good guys because we understand their point of view, but they have done some terrible things. Are they just as much the bad guys? Alanna: I think that in this type of world – obviously I’m not living in it actually, but if I were to – my justification would be what’s the greatest good for the greatest number of people? Is it to kill five people that would potentially kill five hundred? I think that’s why it’s justifiable, because we’re trying to do the right thing. We’re also trying to protect good people and the people who can’t fight and the people who don’t know how to fight – the Judiths of the world. If it happened right now, you would do whatever it took to protect the goodness and the people you love. Seth: I think the key difference between Negan’s Saviours and Rick and the survivors is that the Saviours engage in a level of cruelty that the survivors don’t. Alanna: They’re not bribing people. They’re not making people work for them. Seth: [They’re not] looking to take over camp after camp and looking to expand their horizons in the empire. I think, in a lawless post-apocalyptic society, it comes down to the questions of what is humanity to you and are you actively doing what you can to survive or are you trying to take as much life so that you can survive as possible? It seems to be that the Saviours engage in a level of cruelty that the survivors don’t and that slight difference makes the difference between a good guy and a bad guy. All of your characters are very loyal to Rick. Is there anything you think in the future that could make them go over to the dark side? Ross: I think that in the last episode we see Aaron and Eric deciding whether this course of action was really the best one. Both of them have seen most of the Alexandrians that were in the group when Rick arrived wiped out and I think Eric is finally starting to draw a correlation there. It hasn’t worked out the way we hoped. He just wants to know – moving forward – if we are going to fight against them, do we have certain assurances that most of us are going to come out on the other side of this unscathed? There are no assurances, obviously. I think with Rick, he’s always trying to do right by everybody, but I think for Eric it just seems like a suicide mission. For a lot of the Alexandrian survivors in Rick’s group, they’re deciding if they even have a fighting chance at all with limited resources and limited munitions. It’s tough to say. Everyone wants to believe in Rick. Everyone wants to believe that he’s the leader that they hoped he would be, but once you implement their plans, will it work out? Because in the past, it hasn’t always worked out the best for him. 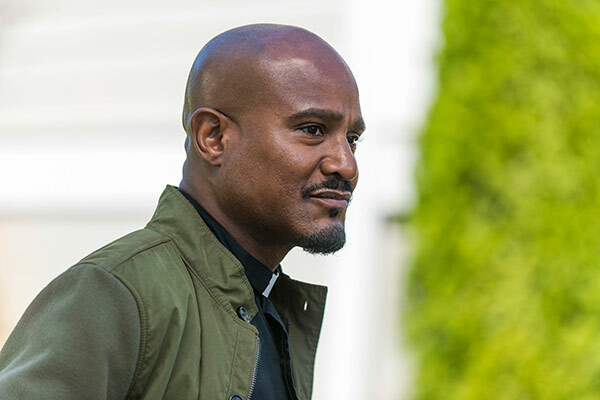 We saw Father Gabriel have a moment where he stepped up a few episodes ago and showed his bravery. What does this mean going forward for his character? He’s finally earned Rick’s respect. Seth: I think Father Gabriel was ready for that moment from the very first episode and Rick wasn’t ready to recognise that. I think Father Gabriel is like a car just revving at the light, waiting for it to turn green, and finally the other people have been given the opportunity to see he’s ready to go. Father’s Gabriel’s like ‘I’m ready coach, put me in, I’m ready!’ and the coach is just looking past him down the bench to some guy who’s in a deep slump. That’s a baseball analogy. I don’t know if that’ll fly here. Alanna: [Whispers] They don’t have baseball here. Seth: Cricket? Rounders? 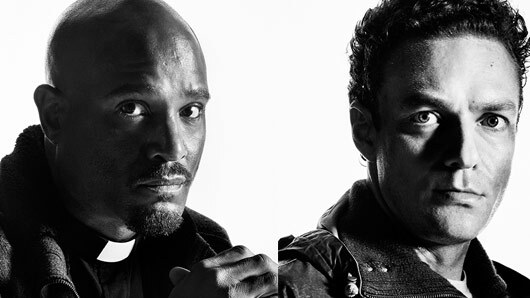 I think Father Gabriel has been ready for a while, and I’m excited as an actor that the storyline has gotten around to the point where he can finally prove it. Although there’s been some criticism of the pacing of this season, I really think it could be the shaping up to be the best season ever. 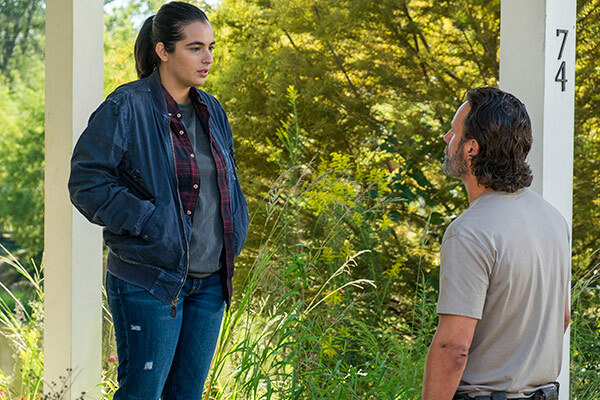 Alanna: As frustrating as [the pacing] can be for some viewers, it’s subconsciously filling this world up and making it really big so when you do start to lose even a person say that doesn’t have as many lines and maybe isn’t in every single episode and you’re like ‘oh man, I really liked that guy’. I think for all of us when we read the finale, we were like ‘OH MY – THIS IS AMAZING’. It really blew me away. I was really excited and it was super fun to shoot. I think if it hadn’t taken fifteen episodes really setting it up, the payoff wouldn’t have been… it would have been ‘oh cool, yeah’… but now we’re really on board. I think it’s really good. Seth: I think societally we’ve grown far more impatient with each day. Instant gratification, instant information – having everything at our fingertips. I think it’s a good thing to remind people what storytelling is all about. It’s not about having the answers the moment a question is asked. Let’s give it some thought and see what the best answer is.